Studying photographs and original Schreyer rifles, it is my belief that there were many hands in Schreyer's shop that stocked and decorated the rifles we attribute to him. 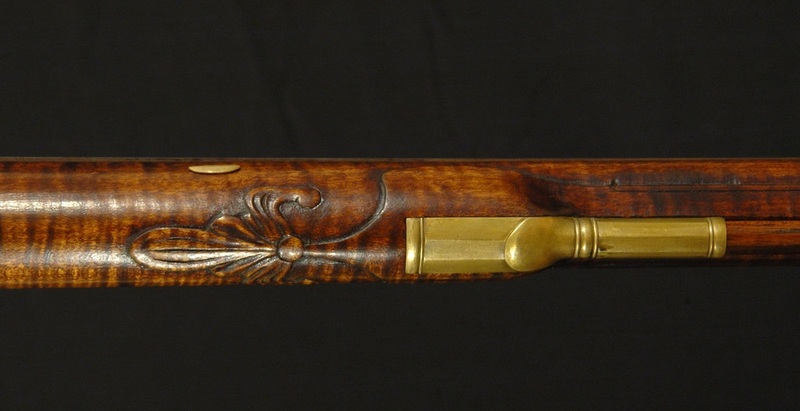 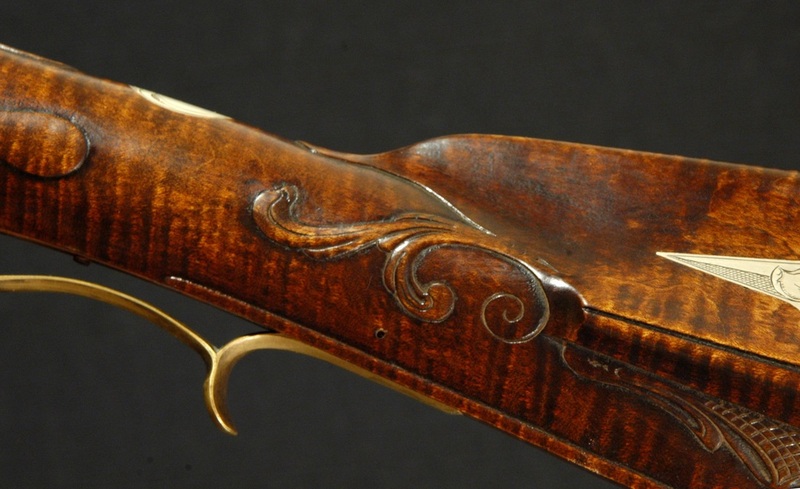 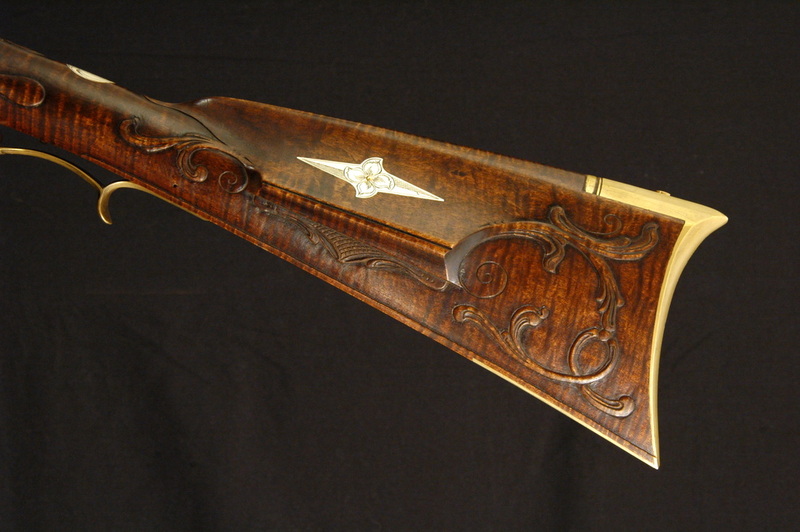 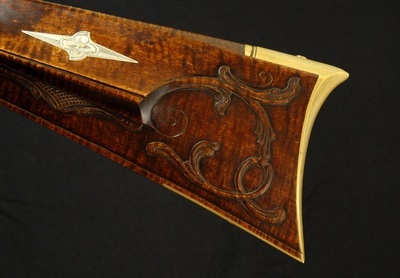 While other gunsmiths and shops generally maintain a level standard of quality throughout their career, there appears to be a much broader range in quality of stocking, shaping, and decoration amongst Schreyer's work. 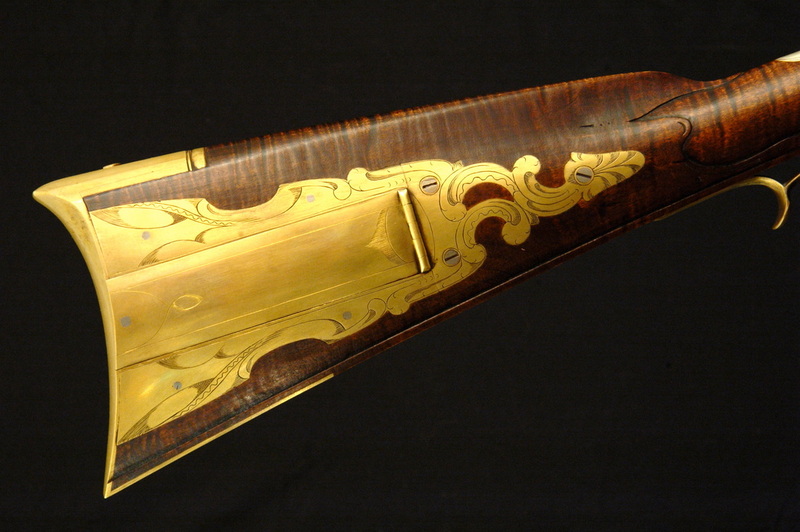 For example, some of Schreyer's carving shows a naivity of design and sculpting, while other pieces are the result of a masterful eye and hand. 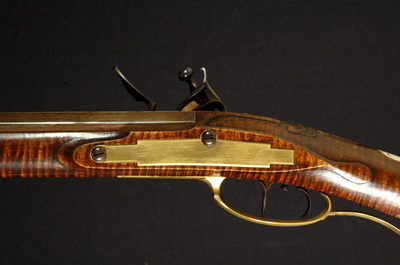 I don't believe that this is merely the progression of skills, age, and eyesight. It is difficult, if not impossible, to distinguish what may be his earlier work from his later pieces based on carving, stock design, and hardware used. 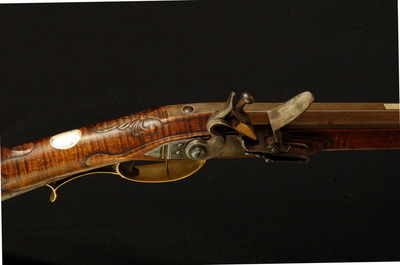 This rifle was built around a 46" .50 caliber barrel with a 1" breech. The lock is a conglomerate of several different commercial castings, with highly customized brass hardware. 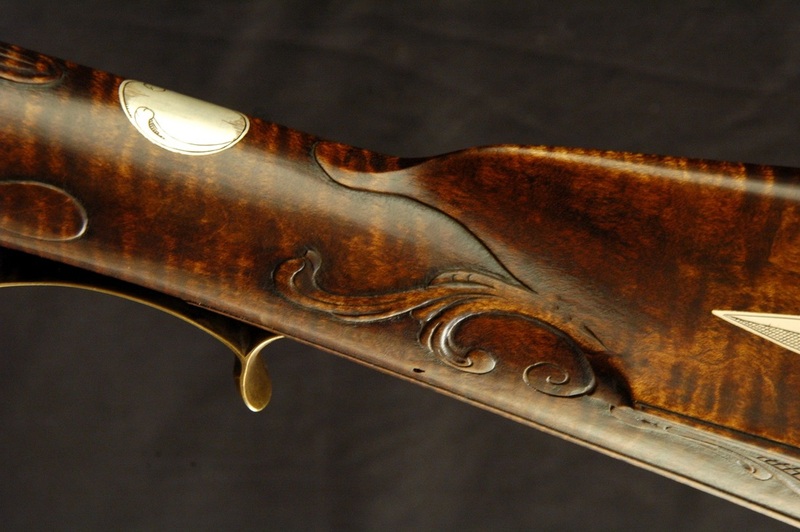 Stocked in sugar maple, the overall rifle is not a copy of any particular Schreyer, but is a blend of some of my favorite features found on his pieces. 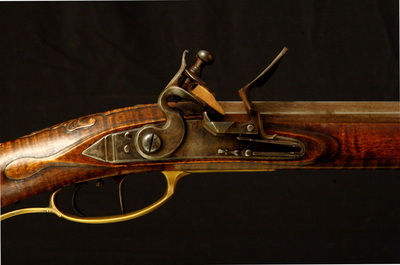 The patchbox is reminiscent of C scroll designs by other York county gunsmiths, but the semi-pointed finial is distinctly Schreyer's hand. 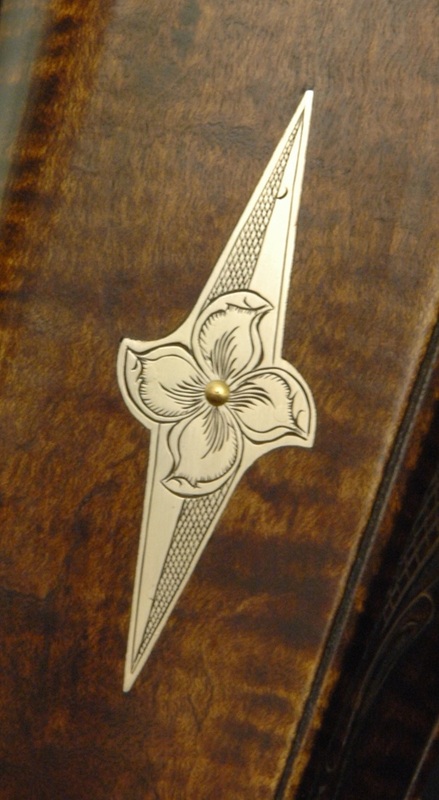 The patchbox engraving is modeled after Schreyer's work, with a fairly standard finial, but evolves into an almost art-deco blend of shading and circles on either side of the patchbox door. 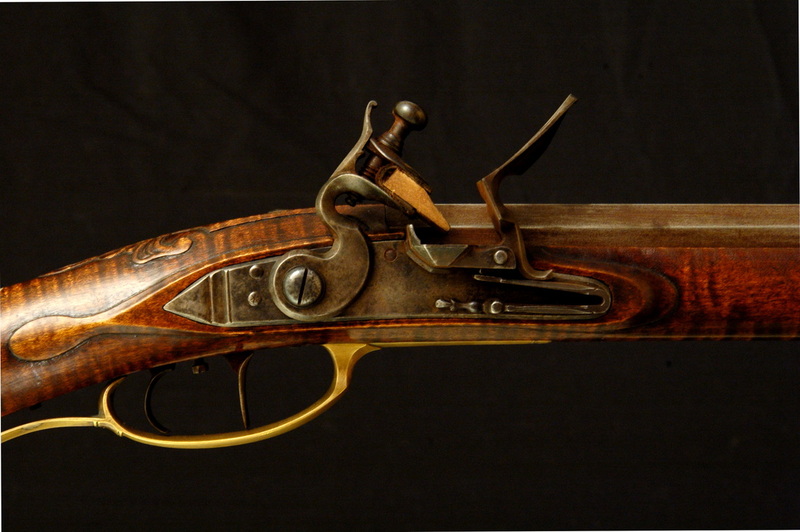 The barrel is held with four brass captured keys, inserted from the lock side in keeping with Schreyer's work. The patchbox release is built into the buttplate instead of being screwed to the stock. 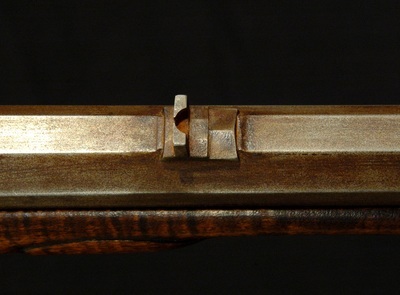 The catch spring is riveted to the buttplate itself, with a captured pushrod following the inside contour of the buttplate. 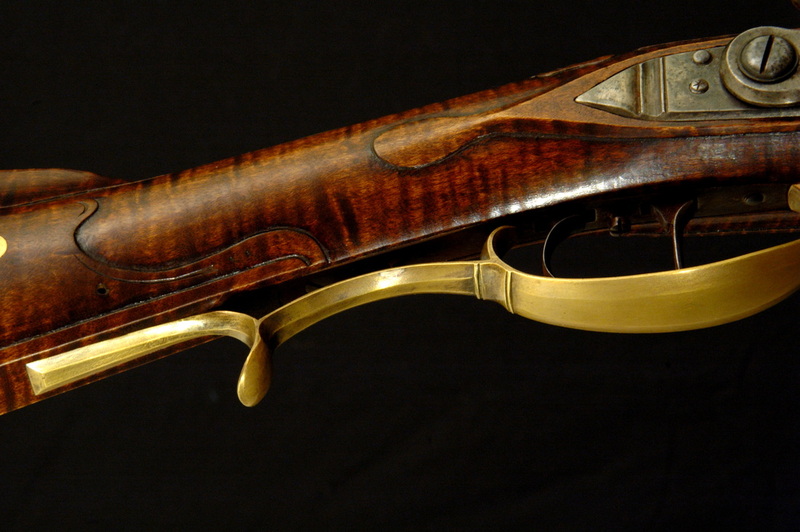 As with all my rifles, the stock is scraped, stained with aquafortis, and then burnished prior to sealing and finishing.